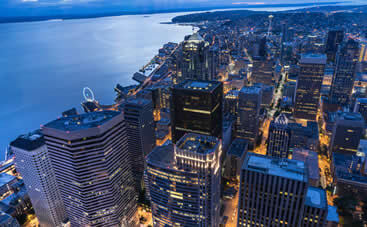 Discover Seattle and its unique points of interest for tourists coming to the area for the first time or those who’ve been here time and time again. With light rain throughout the year and a nearby oceanfront, Seattle is a perfect place for excellent seafood and also has a thriving nightlife. With some of the largest mountains in America nearby the streets can be very curvy. If you are renting a car make sure to be careful if you are not familiar with this type of terrain. If you are looking to find alternative means of getting around you can check out public transportation with the Seattle transit department and travel through the seaports by ferry. You can also hop on a train through the Seattle Center Monorail or you can take a streetcar ride through the Seattle Streetcar. For rides to and from Seattle-Tacoma International Airport can be easily taken by private shuttle vans and taxi services throughout the area. The state of Washington is one of the finest ones in the US with the city of Seattle considered to be among the most beautiful ones in it. It is surrounded by the Pacific Ocean from one side and mountainous terrain and having thick forests on the other. It is the largest city in the state of Washington. Due to its huge size and large demographics, it has evolved into an important business and cultural hub in the market of the US. As a result, people from all over the world come here searching for a better life. The presence of headquarters of both Microsoft and Amazon further add to the value of this city. The commutation needs of the city and its adjoining areas are met by SEA International Airport; the largest aviation facility in the region. The airport has an old building but its internal architect, spacious waiting area, eateries, and live music played in the background make up for that. The management of the airport is very efficient as they have been able to sustain the quality of the services over the years. It hosts hundreds of people on a daily basis but that doesn’t affect the quality of services at all. Due to the demand of the service, most of the flights here are international ones with very few offering domestic traveling facilities. The rail service is directly linked to their airport allowing you an easy commute from here to any part of the city. Leave the Seattle-Tacoma International Airport with ease and comfort by making sure your ride is waiting for you as soon as you step off your airplane. With Seattle’s leading transportation providers for shared ride vans, so that you can get in on any special offers on top of the already-low cost of choosing them. With us, you’ll not only be venturing the magical northwest city without any cares, but in shocking convenience as well. Go for a walk through the beautiful markets and modern pieces of sculpture at Pike Place Market, a Seattle cultural cornerstone that’s famous for showcasing future world talents. Get everyone in your hefty group to go by reserving a private van and allowing you to save time, and by consequence visit even more destinations than you would have. Visit the Woodland Park Zoo at the end of the day and marvel all 92 acres of the conservation-focused exhibits. The Seattle Space Needle is a pivotal part of the city’s iconic skyline, and it’s also open to the public as an observation tower. Go on a romantic drive through the city’s historic downtown streets by booking private sedans. Spend the intimate drive relishing over the fact that you’ll soon be witnessing the sunset from the Space Needle’s observation deck, which is something that’s even more romantic. Whether your kids are into science or not, the Pacific Science Center is an incredible cinema chain that any age can enjoy. Famous for its 3D films and on-site science museum, the facility was designed in honor of the 1962 World’s Fair, standing proudly as a testament to the honor of learning. Show up for one of the many films as a family by riding together in privacy and safety with one of our top-brand SUVs. Canlis is a highly celebrated American restaurant that serves classic dishes on the edge of the stunning Lake Union, a dining experience that offers guests great views and even better dishes. Make a reservation for your dinner, and after that reserve a stretched limousine to have your private chauffeur come pick you up, dropping you off wherever you desire in the utmost elegance. After dinner, take a ride to Diller Room, a bar that is as historic as it is posh. Large groups of people shouldn’t be nervous to travel around a big and busy metropolis like Seattle, especially because there’s so much room to get lost. If interested in experiencing all there is to do in Seattle, you’re going to need to know exactly how you’re going to get there. If you haven’t already figured out transportation, look no further than our local providers of chartered buses and other plus-sized vehicles. Arrive to the newly opened Seattle Great Wheel for an astounding view of the city or head over to Kerry Park for a day of scenic hiking and bird watching. 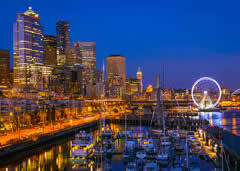 Located near downtown Seattle, the waterfront is a long stretch of parks, ferries, piers sightsee across and boardwalks. Beginning at Pioneer Square this area follows the coastline to Shilshole Marina. Along the way you can find many things to do such as the famous Pike’s Place Fish Market where where you can see the catch of the day, literally. This place is known for its employees putting on a show by throwing and catching the fish. As one of the largest aquariums in the United States the Seattle Aquarium allows its visitors to experience a unique hands on interaction with sea life. From various marine life native to the Pacific to watching divers swim through the aquarium waters while interacting with the audience and answering questions, you can enjoy a day out with the family. The Olympic Sculpture Park is an outdoor park that has unique urban sculptures on display for visitors to view. This park is free and open to the public so if you are near the waterfront of Seattle this is a nice place to visit while you are in town. You can even grab a bite to eat while you are here at Taste. Taste is located in the park and offers various pastries, snacks and coffee. With amazing views of Mount Rainier as well as the Puget Sound, the Myrtle Edwards Park is a great way to spend the day. Whether you are walking along the trails or take out your bicycle for the day you’ll find this park a great place to relax. If you continue on the trails you will run across the Olympic Sculpture Park which is worth visiting along the way. 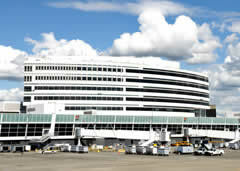 The SEA-TAC airport is conveniently located with easy access from downtown. There are many ways that you can get through the airport quicker, such as confirming your travel details ahead of time or knowing the TSA guidelines before you get to the airport. The airport has a helpful guide to answer most of the questions travelers have about making their way to or from their flight. It is also helpful if you take the time to get familiar with their travel updates so you can have a positive experience as you make your way to your destination. → There is an area for children to play near the Seattle Taproom. It also includes a fully equipped rest area for nursing mothers designed for them to take care of their infants. → For easy parking access at the airport you can park at the Terminal Direct lot. This is also where you should park in order to pick up friends or family.